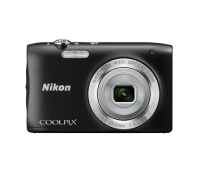 You can see list of our Nikon Point and Shoot Cameras Price List below, perform Side-by-Side comparison. If you need further help, do have a look at Conzumr Guides and Tips. Alternatively you can view all Camera to choose your own favourites. NFC-compatible AndroidTM smartphones and tablets (AndroidTM 4.0 or later), Shoot with the Electronic Viewfinder (EVF) with eye sensor, or flip out the 3-inch vari-angle LCD monitor for more unique photo compositions. Let the world be your playground with the new AW130. Relive your adventures with this waterproof, shockproof, dust and cold-resistant camera and record every adrenaline pumping moment with the 16-megapixel backside illumination CMOS sensor and Full HD video capabilities. Share your epic escapades with your family and friends instantly with the built-in Wi-Fi and NFC. On land or underwater, the AW130 will be right there with you. Dive to depths of up to 30m, or head to the slopes and shoot at temperatures as cold as -10°C. Best of all, the AW130 is dustproof and shockproof to a drop of approximately 2.1m; so the next time you decide to take it to the limit, the last thing you have to worry about is your camera.Take underwater photography to the next level and capture your dive escapades like never before with an array of optical accessories such as the Underwater Speedlight and Bracket. For your land adventures, strap the AW130 to your chest with the optional harness and create jaw-dropping first-person photo sequences and videos that'll make your friends feel like they were there. SUPER SLIM STYLING THAT’S ALWAYS AT HAND, 20X OPTICAL ZOOM AND 40X* DYNAMIC FINE ZOOM IN A COMPACT STYLISH BODY, EASILY SHARE MEMORIES WITH WI-FI® AND NFC..
Meet the camera that’s always in the thick of the action. With the world’s lightest design*1 in its class, the compact 16.0-megapixel S7000 packs a surprisingly powerful 20x optical zoom that lets you get up close and personal. It’s delightfully quick on its feet too, with short response times that help you capture every candid moment. New video features let you create coo-worthy videos your inner filmmaker will be proud of. To share your videos*2 and pictures, just sync your camera to your smart device via its built-in Wi-Fi or NFC*3. All these and more in a camera that captures everything effortlessly. Shooting high-quality images just got even easier with the L31. 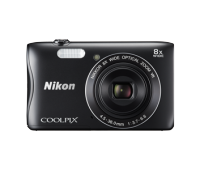 Take advantage of its 16.1 megapixels and 5x optical zoom to capture every moment in your life. With the Motion Detect blur reduction function, you can shoot wide-angle group shots with your friends to faraway subjects without worrying about blurred images. All you have to do is aim, preview your shot with the 2.7-inch LCD monitor, and the L31’s Easy Auto Mode will do the rest. Add your own creative spin to your photos with the L31’s Special Effect and Quick Effect functions. The Smart Portrait System and Skin Softening effect comes with improved face detection and enhanced skin tone exposure control so your subjects will look flawless. Stand out from others with these built-in fun effects that lets you get more imaginative with your photographic expressions. 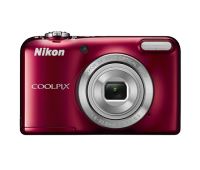 2.7 " Coolpix S3700 (Black) : 2.7 "
2.7 " Coolpix S2900 (Black) : 2.7 "
2.7 " Coolpix L31 (Red) : 2.7 "
3 " COOLPIX S7000 (Golden) : 3 "
Rechargeable Li-ion Battery EN-EL19, Charging AC Adapter EH-71P(*), USB Cable UC-E21, Camera Strap * A plug adapter is included if the camera was purchased in a country or region that requires a plug adapter. The shape of the plug adapter varies with the country or region of purchase. COOLPIX S7000 (Golden) : Rechargeable Li-ion Battery EN-EL19, Charging AC Adapter EH-71P(*), USB Cable UC-E21, Camera Strap * A plug adapter is included if the camera was purchased in a country or region that requires a plug adapter. The shape of the plug adapter varies with the country or region of purchase. 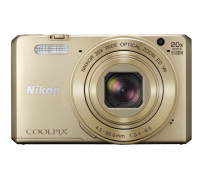 To Recieve updates and possible rewards for Nikon COOLPIX S7000 (Golden) please sign in. To Recieve updates and possible rewards for Camera please sign in.